Autumn is upon us and fall flowers are an excellent way to signify this! With autumn comes changing leaves, warm apple cider, bonfires, and pumpkin lattes! We love fall, and the gorgeous colors of fall are what make it feel like the holiday season is upon us. The warm browns, rich burgundies, and bright yellows grace all of the trees and bring about the happiness of the start of this time of year. Here are a few ways to bring those colors indoors! This gorgeous bouquet is full of Autumn colors that will make you want to curl up with a book and some hot cocoa. Orange Peruvian lilies, rust-colored Asiatic lilies and red hypericum berries come in a purple vase that perfectly compliments the earthy bouquet colors. For an elegant look, a monochromatic arrangement, such as this bouquet of orange roses and Peruvian lilies is a stunning option. This would be a beautiful adornment on one’s work desk, or as a hostess gift. Fresh flowers are a wonderful centerpiece for dinner tables, as they bring life to autumn decor. This festive bouquet comes beautifully arranged in a ceramic pumpkin container. Brandy roses, butterscotch daisies, red Asiatic lilies and burgundy mini-carnations are deliciously suited for a buffet table. This fun cornucopia arrangement reflects the fall bounty with vibrant sunflowers, red roses, burgundy daisies, and orange Asiatic lilies that are spilling out of a cornucopia basket. Sure to bring a stunning element to any holiday table. Plants are a beautiful way to welcome the fall season, especially if the recipient is not a fan of flowers. The Croton plant is a beautiful representation of the season, with multi-colored leaves of yellow, green and red. Planted in a beautiful brown ceramic container, this plant is a lovely gift. If a potted flower is desired, autumn lilies are a beautiful representation of fall. This lily plant features both a yellow Asiatic lily plant, and an orange calla lily plant. They come seated together in a beautiful rustic planter, and would be a lovely way to say “Happy Birthday” to those who celebrate their birthdays during autumn months. 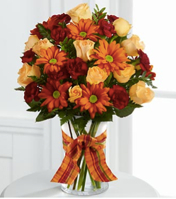 With autumn officially around the corner, get a jump start on welcoming the season by brightening someone else’s day with beautiful fall bouquets!